I was called by my bee supplier Ray Olivarz today. The weather in Chico California has been cold and rainy for the last three weeks. Weather like this in northern Calif has never been this cold and wet in his memory. The weather has provided poor queen rearing conditions. 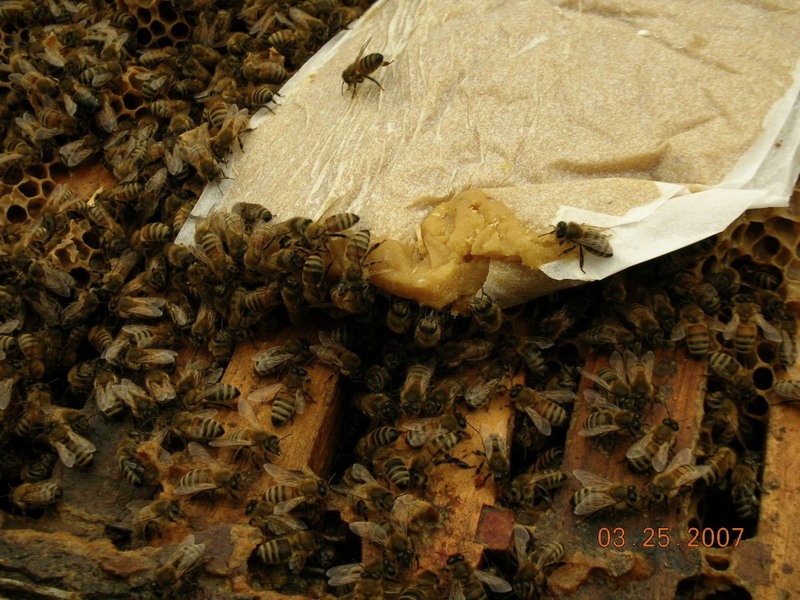 All of the queen and package bee suppliers in Calif. are suffering from the same conditions. This may also impact queens being sold for divisions. Because of this, the bee pick up date will be delayed TWO weeks for each load. The quality of the packages and queens is very important to us and please know that we appreciate your patience in this matter. This is what has been happening in California. The weather has been raining and the temperatures have been under 60 degrees for the highs. Proper queen mating occurs at temperatures over 60 degrees. The bee supplier has been setting out 35,ooo mating nucs. With all of this, the present mating attempts has been unsuccessful. They graft queen cells every other day through the season. The queen cells take 14 days to mature to put into the mating nucs and the queen breeder has to hope for proper weather conditions when the queen cells are ready to go. The cells develop in finishing colonies and on day 14 they are ready to put into mating nucs. The queens emerge in the mating nucs. They are able to fly and go on mating flights after about 5 days. The weather now is finally turning around with temperatures rising into the 70's. The shaking of packages normally starts on March 28 for his first load leaving Calif. (Nature's Nectar is the second and fourth load) now the shaking will start on the 10th of April. So basically they are two weeks behind. While we will do everything we can to provide the queen that you ordered the bee supplier says there is a possibility that the queen that you ordered may be a different queen. Be assured though, that all queens in the packages will be properly mated. Mother Nature has been challenging this year all around the country. The colonies I have checked that were alive looked pretty good. A couple were low on food stores. I bolstered the light ones with frames of honey from a nearby dead out. This time of year feeding with syrup isn't recommended. Obviously, if a hive needs food and there is no other option then the syrup pail goes on. When a colony has very little food this time of year feed syrup. The reason feeding now is not preferred, is the dicey weather that happens this time of year. Feeding syrup kicks the hive into high gear. The syrup is a nectar flow and brood rearing will accelerate. If the weather turns cold like it is supposed to at the end of this coming week. The queen may lay a couple frames more of brood. With the cold weather, the cluster of bees may contract off some of the brood and the brood will get chilled and die. This can set back development of the colony for the spring build up. With some luck there will be a good turn around on the weather front and the bees will be in good shape for May divides. I do have a weak colony. Two frames of bees, it does have some brood so it seems queenrite. If there is no brood, I look for the queen. I know that it is too weak to be a honey producing colony. It may build up to a strong colony by August but it may be a liability if I have to feed it large amounts of syrup in late summer. The best thing to do is bolster it with a 2 lb package of bees. All I do is start the package in a box as normal. During this time hopefully the weak colony has got a little better. When it is time to add a second box to the package, sometime in May. I go into the weak colony a find the queen and dispose of her. The weak hive is then left queenless overnight. The next day a sheet of newspaper with a tiny slit in the paper is put on top of the package. The weak colony is then put on top of the package on the newspaper. The bees will slowly chew through the paper and unite the two colonies. I talked to my bee supplier from California today. He told me as of now everything is still on schedule. They have been getting good queen mating weather. Dodging some rain but he claims they have been getting good mating results. Note the brown spots. This is normal. This is NOT nosema. This time of year when we have some of the first warm weather the bees will storm out of the hive on cleansing flights. If that happens to coincide with your trip to the beeyard then your bee suit may be a little stained. 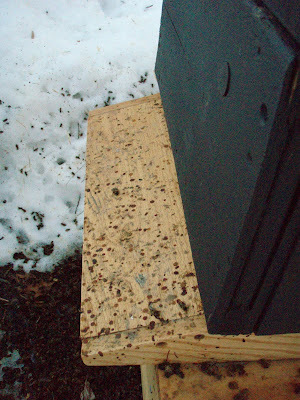 Nosema is defecation in the colony all over the frames and running down the front of the hive's top entrance hole. I finally trudged out to a bee yard to see what is alive and not. I did have some loss in this bee yard, but some are alive as well. I put pollen patties on the live ones. I checked the stores on the live ones by lifting up the top box to determine honey weight. I almost threw one over my head anticipating a bit of a grunt in the lifting process. It was very light and starvation was imminent. Some of my dead outs must have died in the first week of Feb with the week of below zero weather. There was honey in the hive but the bees had their heads in the cells with their butts looking out at me. This was the look of classic starvation. There was some brood in the cluster and the bees died trying to keep it warm. I moved some frames of honey to the live hives that needed it. I did not bring syrup with me and really don't want to feed right now unless I have to. But if the bees need food and all I can give them is syrup, then syrup it is. If I feed syrup this time of year I give them a heavy syrup. I don't want to lose the bees at this stage of winter. I have left the winter covers on for now and will remove them if the weather is on a warming trend that looks like it is here to stay. The sun is stronger now and will start to beat up the boxes and melt the wax coating. I usually always take off the covering by April first. This week the snow will be gone by Saturday and I should be able to look at the rest of my colonies. I still have time to get packages if I have to replace dead outs. I love this picture. I threw this patty on a strong over wintered colony in March of 2007. The bees were instantly on it. You can see them on the edge of the patty getting the pollen substitute that they need so bad. It is time to put on pollen patties. The weather is on the upswing and there is brood in the colonies. Pollen patties are an important spring food supplement that will make a colony prosper. Good quality pollen substitute gives the bees protein that will not be available until the early spring pollen sources become available. Natural pollen in the spring is all weather dependent. So it is important for the beekeeper to have a protein source on the hive at all times. This protein helps the hive produce strong,healthy bees. It also promotes proper physical development of the bees. Without this the bees will have a shorter life span, shorter foraging ability, poor gland development that leads to poor quality Royal Jelly production. Not producing good quality and ample amounts of Royal Jelly impacts the entire health and quality of the hive. Pollen patties go on where the bees are, right next to the cluster. If the bees are still in a lower box, the patty has to go underneath the top box. Normally the bees have moved up into the top box and the pollen patty lays on the top bars under the inner cover. A note on feeding syrup. I avoid feeding syrup until early April unless there is no feed in the hive. Feeding syrup gets brood rearing going into high gear. If it gets cold and the cluster contracts, the bees will not be able to keep all the brood warm. Some of the brood will get chilled and die and actually set the colony back in their spring build up time line. Pollen substitute is well worth the money. It will help build a population up so a May divide is in the future.